RAM is one of Haiti’s most popular and important bands. Founded in 1990 by half-Haitian American expat Richard A. Morse, the 13-piece band has played every Thursday night at the Hotel Oloffson in Port-au-Prince for 25 years, tweaking the politicians and generals who run Haiti (and the men who own them) with their biting lyrics. This is their sixth album, and it shows off RAM’s command of a wide variety of Haitian musical idioms. 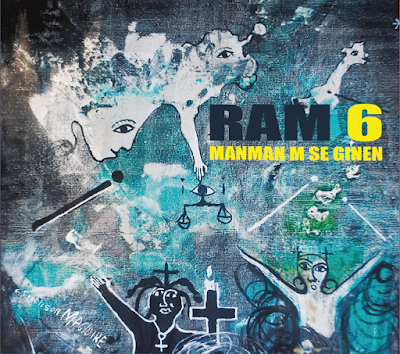 RAM’s style is called mizic rasin (“roots music” in Haitian Kreyol); Morse describes the sound as “vodou rock and roots.” They use both traditional (rada and petwo drums from the vodou ceremonies, bamboo vaksen horns) and contemporary (electric guitar, Roland Octapad) instruments and their repertoire is both original and from the tradition. Track 3 is an 18th century prayer married to a zouk guitar line; 4 is a soulful midtempo march; 6 is a critique of “Hypocrites” who “eat and forget”; 11 is a blowout that fuses punk rock and rara parade music in tribute to the vodou spirits of life and death. My favorite here is 8, in praise of the spirit of the forest, which shows off the full breadth of RAM’s capabilities. Great stuff.